The fact that you have installed Greener Web on your system might just mean that you will start seeing various commercial ads on your screen. The publisher of Greener Web seeks to lure computer users into clicking on those ads in order to route them to third-party websites. However, we do not recommend doing that because there is a slight possibility that you will infect your system via all those commercials. Thus, if you ever notice them on your Internet Explorer, Google Chrome, and Mozilla Firefox browsers, you should definitely ignore them all. Unfortunately, it is still possible to click on them accidentally, which is why we recommend that you erase Greener Web from your PC. If you decide to keep an advertising-supported application on your system, you should know that you will always be at risk of infecting your PC because all those in-text, interstitial, search-related, and other kinds of ads might just simply take you to corrupted websites after clicking on them. Keep in mind that there are plenty of other adware application published by Super Web LLC that act in the same manner and thus have to be avoided, for instance, Fortunitas, Surftatic, and MossNet. If you ever notice any of their presence onto your PC, you should definitely remove them from the system as soon as possible. If you are tired of all those ads that keep appearing on various websites including those where you can shop online, you should delete Greener Web without any further considerations. The best thing is that the removal of this adware will not cause you any problems; however, it is still advisable to scan the system with a reliable scanner after the manual removal. If you wonder why it is so important, you should know that not all the components can be removed manually and thus they might still act suspiciously behind your back. Locate the suspicious program and select it. Find Control Panel. Select it. Find Control Panel on the list of applications and select it. 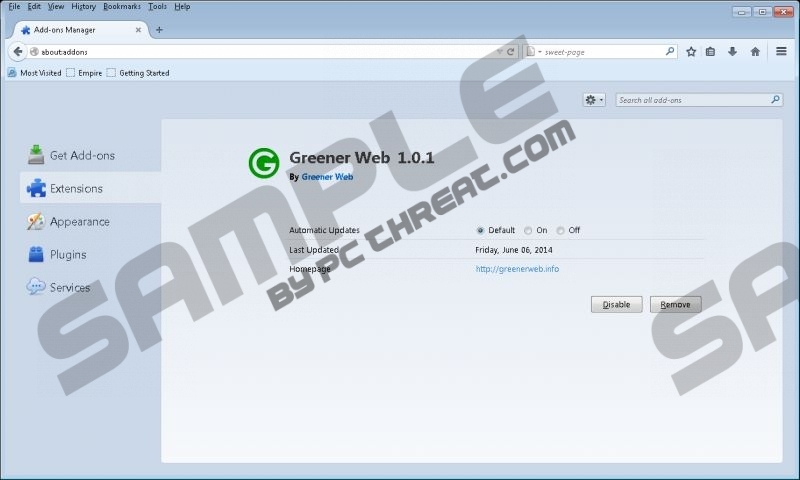 Quick & tested solution for Greener Web removal.